I need to find a new home for my miter saw. I've decided I want to move it into my main workshop and put it on a new bench. 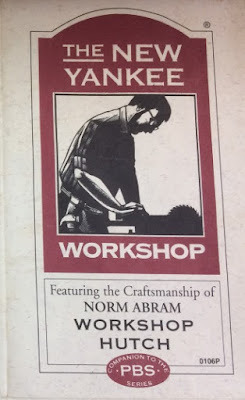 Fifteen years ago when I started woodworking I bought the New Yankee Workshop plans for the Workshop Hutch. At this point in time I want to use the bench but not the shelves. The wall space above where the bench is going to go has a wood rack that I kind of like and want to keep. I'm not going to put the miter saw directly on this bench, I'm going to build a second bench next to this one and put a shelf between them to hold the miter saw. 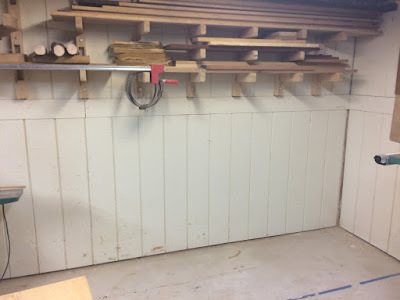 By setting the miter saw shelf a bit lower than the benches I can use the bench tops to keep the ends from sagging. I don't remember where I saw it but I'm going to put dog holes in the bench top. These will allow me to put a removable fence for when I'm cutting boards to length and can put it away when I want some open space. Day one showed little progress; however, it was a lot of work to get there. I cut the four vertical panels - two for the middle and two for the ends. 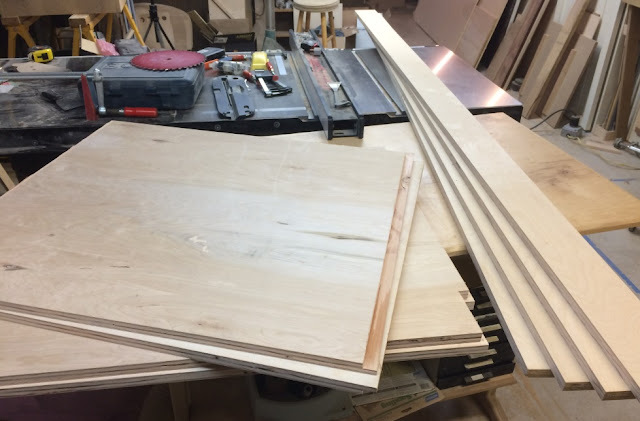 My typical process is to break down large panels in my garage using a circular saw and a temporary bench and carry the pieces down to the basement piecemeal; however, the plywood had already been moved to the basement ten years ago. I thought about bringing the foam in from the garage and breaking the panels down as I normally do; however, I decided to run them through my table saw. It worked but the full sheets of plywood were heavy and awkward. After cutting the four panels to size cutting the four horizontal strips was easy. 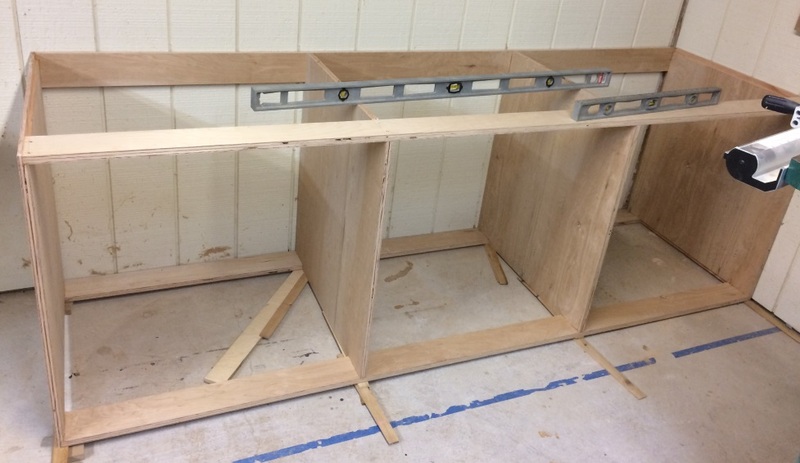 Norm's plans have cutting diagrams using three sheets of 3/4" plywood very efficiently; however, it includes parts for the hutch that I'm not building. He uses almost an entire sheet just for the drawer fronts and lays them out so the grain will flow from one to the next. I don't particularly care so I am going to source my drawer fronts from two separate sheets to minimize waste. After getting the panels cut out the vertical panels required a bit more work. The middle panels get four notches for the horizontal strips and the end panels get a 3/4" rabbet on the top, back and bottom sides. I cut the notches using my jig saw and the rabbets using my table saw with a dado blade. I only had a half inch of dado installed in the table so I made the rabbets in two passes. Including moving all the plywood out of the spot the bench is going into this was pretty much a full afternoon of work. I did all the work cutting the panels and horizontal strips on Saturday. Sunday I tried buying some full extension slides from my local Woodcraft; unfortunately, they didn't have any. I settled for ordering a half dozen from Amazon. I love Amazon Prime. Monday evening a friend of mine who is also a woodworker helped me pick up the 2x4s, 3/4" plywood and 1/4" melamine for the top. Tonight I got a few hours in the shop and assembled the bench base and started working on the top. I carefully laid out lines on the cross braces for where the panels were supposed to go. The getting the first brace attached to the two middle panels was a bit tricky. If I had a shop helper I would just have had them hold one of the panels. Instead I used a couple of large wood clamps on the bottom of the panels to keep them vertical. I then glued and screwed the first cross brace - the back - to the middle two panels. Then I rolled the carcass over and attached the two bottom cleats. I then checked the spacing to make sure everything was spacing correctly before moving on. I decided to attach the two end panels before attaching the last cleat. While I was checking spacing between all the panels again I thought, "hey, wouldn't this be easier if I just had a stick that was the right length. Then I wouldn't have to keep pulling out my tape measure." Well, I was almost done so I just kept using my tape measure but perhaps next time I'll remember to cut myself a story stick before assembly. Anyway, I attached the two end panels and the final cleat. I did need to adjust two of the cleats on one of the end panels but it all came out good in the end. Then I started the process of leveling it. From the back right corner to the front left corner there is about a 1" drop. I haven't fastened it to the wall yet or glued the shims in place yet. I'll probably do that next time. I figured it would be better to think about it for awhile rather than rushing into it. I had a little bit of time left so I cut the cross members for the top out of the 2x4s and built a router jig that will let me create half laps with a pattern bit. But more on that in the next post.